Rockaway Beach: Close to 5,000 Irish Americans came together this weekend to help a shattered Catholic congregation in Rockaway, New York come together. Many wore t-shirts emblazoned with the AOH logo and “Rockaway Beach, Breezy Point Strong” and that said it all. Amazingly, in an mayoral election year, no politicians showed up, though City Council Speaker Christine Quinn did provide some buses. As for Mayor Bloomberg, “He wouldn’t dare show his face around here,” one festival goer said to me. Sure, the Irish have long memories but when you consider Bloomberg prioritized holding the NYC marathon after Sandy and not local relief efforts it is easy to see why. The absence of City Hall denizens and would-be mayors made no dent on the days however. On a glorious weekend that must have been ordered up by the saints, the crowds milled around at the Irish festival arranged by the Ancient Order of Hibernians, an organization once again showing remarkable community leadership in times of crisis. There was Irish dancing, marching bands, pounding drums, rebel songs, sweaters for sale, lots of Guinness and craic and good cheer. But behind the smiling faces there was a deadly earnest mission – to make things right in Rockaway, the isolated inlet pounded by the hurricane. The weekend was one more example of the best of the Irish in adversity. The Irish festival in the grounds of St. Camillus raised tens of thousands of dollars for the stricken parish. I was shown the dreadful destruction still evident in the church hall and community center, stripped bare after the angry ocean poured in during Sandy. The money raised by the Irish will go a long way to repair it. So too will the busloads of Irish who arrived from all five boroughs many skilled in the construction trade. It was the third “Irish Day of Action” in the Rockaways and the community gave its usual warm-hearted response. 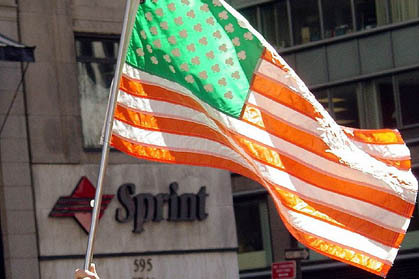 Kudos to the Irish consulate in New York which organized the five-borough presence and previous days of action. Consul General Noel Kilkenny and Deputy Consul Peter Ryan can be rightly proud of what they have achieved. St. Camillus parish, just blocks from the ocean, took the full onslaught of Superstorm Sandy last October and now, eight months later, is still in dire need. St. Camillus is not in a wealthy area and many of the parishioners are in dire need themselves. Like the saint himself who ministered to the poorest, Camillus Parish has its fair share of people in need. The Ancient Order of Hibernians, under dynamic Queen County leader John Manning, grabbed the initiative and put together the festival. The Irish community came on board and added work crews as well. “I'm humbled by the faith of the people, by the generosity of the people, and by the spirit of the people...” Father Richard Ahlemeyer, the pastor said recently describing his parishioners. That sounds like what the Irish have pulled off in Rockaway these days. A hearty well done to everyone.